Much as I’ve enjoyed following Magic’s story in the past, there are still gaps in what I know. The original Elder Dragons, Nicol Bolas’ siblings from Legends, were before my time, and a lot of what I’ve heard about them is second-hand (and considering how long ago some of the sources seem to be, may not be entirely canon now). 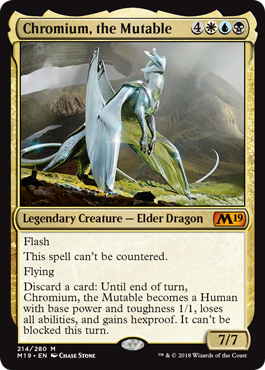 I was always told that Bolas was the last of his kin, but the M19 player’s guide suggests that that may not actually be the case. That alone has piqued my interest in future stories: if the Gatewatch can’t beat him, perhaps somebody like Chromium can . . .
He’s certainly built for survival. I think he would be worth looking at even if he was just his stats with flash and uncounterability, as that’s at least a couple of relevant qualities for a curve-topping creature in control and midrange decks. I like the ability to transform himself into an untargetable human, although I think it can also turn out to be a trap in certain situations: a canny opponent could trick you into transforming him while he’s attacking, and thus make him become vulnerable to a blocker or a global damage spell. I tend to feel that if you look at him as an Esper-colored finisher, things will go pretty well. Of course, you could always transform him for a turn to enchant or equip him without fear of responses, and then things get interesting . . . Besides Nicol Bolas, Chromium is the member of the Elder Dragons 2.0 that has gotten the most attention by being a very hard to answer threat. Unanswerable 7/7 with flying? Sure. Ability to downsize to dodge target removal? Why not. While it can be answered by damage-based board wipes and Wrath effects, Chromium is a fast, efficient, and evasive clock for Esper decks of all shapes and sizes, and he’s definitely a threat to look out for.